Software : NetEnt, NextGen, Betsoft, Pragmatic Play and many more. Africasino is an online casino that is tailored towards South African players offering them everything that they want and more. The online casino is powered by multiple software providers, so they are able to bring you the best games possible. At Africasino, you will find an amazing selection of games, generous bonuses and promotions, safe and secure banking and fast withdrawals. South African players are able to make deposits via Neteller, EasyEFT, Skrill, ecoPayz, Visa and MasterCard. Withdrawals are quick and easy and can be paid out via Wire Transfer, Skrill, Neteller or Visa. Withdrawals take between 2-5 days depending on the method used. The multiple software providers allow Africasino players to play a range of games that include some of the best titles. Some great title include Starburst, Guns N Roses and Motorhead. There is also 10 progressive jackpot titles from Betsoft that are pooled across the casinos network. Jackpot titles include Greedy Goblins, Mr. Vegas and Glam Life. These jackpots are triggered at random, so anyone has the chance to win some massive prize money. They also offer a range of table games, video poker, keno, scratch cards and a live casino. Africasino can be played via instant play with no download required. Africasino Mobile Casino - Play Online Casino Games From Your Mobile or Smartphone in Rand. Africasino is an instant play online casino that can be accessed through your mobile browser. You will be able to play Africasino on the latest smartphones and tablets on Android, iOS, Blackberry and Windows devices. At Africasino, South African players will find a generous welcome bonus as well as other promotions. The customer support is friendly, knowledgeable and are available 24/7. Players will be able to play more than 250 games on their mobile devices and are able to take advantage of the same bonuses and promotions. Games on mobile include NetEnt Touch slots, live casino, table games, scratch cards and virtual sports betting. New players at Africasino can claim a R300 Free No Deposit Bonus on registration and verification of the new account. You will need use the Coupon Code: PLAY300 to claim this exclusive bonus. You can also avail a great welcome bonus package. The first deposit will give you a 300% match bonus for up to R6000 plus 20 zero wager free spins. The second deposit will give you a 50% match bonus for up to R1000 plus 50 zero wager free spins. The third deposit will give you a 100% match bonus for up to R3000 plus 30 zero wager free spins. Take a look at their promotions page to find other exciting bonuses..
Africasino offers players a number of benefits and a safe and secure online gambling experience, which is why this casino is a must for all South African players that are looking for an exciting and reputable online casino that has been tailored to their needs. Check out Africasino today!! Game Variety: Table Games, Slots, Video Poker, Keno, Scratch Cards, Live Casino. Deposit Options: Neteller, Skrill, EasyEFT South Africa, ecoPayz, Visa & MasterCard. 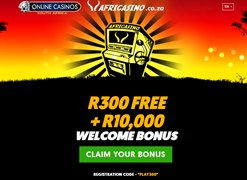 Operated by: Equinox Dynamic N.V.
No Deposit Bonus: R300 Free (Redeem Code : PLAY300) Offer expires soon! Weekly Bonus: Happy Hour Fridays. Visit sitefor details. Key Feature: Progressive jackpots, VIP Loyalty Scheme and Live Casino.